CAPE TOWN (Reuters) - A development bank set up by the BRICS group of emerging economies has approved around $790 million of loans for three projects in South Africa, the bank's president said on Monday, with over half that amount going to power company Eskom. Separately, the New Development Bank (NDB) and Eskom also signed an agreement for a $180 million loan for a project to integrate renewable energy capacity into South Africa's electricity grid. Eskom is battling for its survival after a decade of steep financial decline during which its costs soared and electricity sales stagnated. South African President Cyril Ramaphosa has promised a 69 billion rand ($4.9 billion) bailout for Eskom over the next three years and says the company will be split into three to make it more efficient. But the cash-strapped utility is still hunting for more money to shore up its finances. 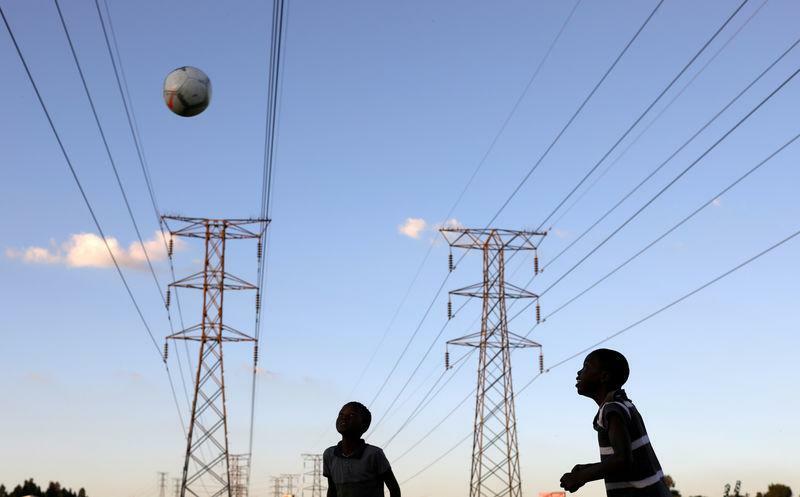 A source at the NDB - founded in 2014 by Brazil, Russia, India, China and South Africa to fund infrastructure projects in emerging markets - said that around $480 million of the $790 million was for Eskom's Medupi power plant project in the north of the country. The rest of that money would be split between the Lesotho Highlands water project and a renewable energy venture, the source said. Problems at Medupi, which will be one of the largest coal-fired power stations in the world when complete, are partly responsible for the latest round of power cuts which Eskom implemented this year. "We plan to end the year with total loan approvals of about $2.3 billion in South Africa," NDB president K.V. Kamath told the bank's annual meeting in Cape Town. Dondo Mogajane, director general of South Africa's finance ministry, confirmed part of the approved funding was for desulphurisation equipment at Medupi. The NDB's Chief Financial Officer Leslie Maasdorp told a news conference that the development bank also planned to sell its first rand-denominated bond in the second half of the year. "We applied for a 10 billion rand programme, and we have received approval to proceed," Maasdorp said.